"Parking garage" redirects here. For the Seinfeld episode, see The Parking Garage. A multistorey car park (UK English) or parking garage (US English; also called a multistorey, parkade (mainly Canadian), parking structure, parking ramp, parking deck or indoor parking) is a building designed for car parking and where there are a number of floors or levels on which parking takes place. It is essentially an indoor, stacked car park. Parking structures may be heated if they are enclosed. Design of parking structures can add considerable cost for planning new developments, and can be mandated by cities or states in new building parking requirements. Some cities such as London have abolished previously enacted minimum parking requirements. A circa 1929 drawing shows a cross-section of a typical multi-storey car park of that era, using the d'Humy Motoramp design. The earliest known multi-storey car park was opened in May 1901 by City & Suburban Electric Carriage Company at 6 Denman Street, central London. The location had space for 100 vehicles over seven floors, totaling 19,000 square feet. The same company opened a second location in 1902 for 230 vehicles. The company specialized in the sale, storage, valeting and on-demand delivery of electric vehicles that could travel about 40 miles and had a top speed of 20 miles per hour. The earliest known multi-storey car park in the United States was built in 1918 for the Hotel La Salle at 215 West Washington Street in the West Loop area of downtown Chicago, Illinois. It was designed by Holabird and Roche. The Hotel La Salle was demolished in 1976, but the parking structure remained because it had been designated as preliminary landmark status and the structure was several blocks from the hotel. It was demolished in 2005 after failing to receive landmark status from the city of Chicago. A 49-storey apartment tower, 215 West, has taken its place, also featuring a multistorey car park. A large, mostly enclosed multi-storey car park forms the base or "pedestal" of two connected high rises. At nearly 20 stories and over 200 feet (61 m), it is an exceptionally large car park that comprises a significant portion of the building. Where the car park is built on sloping land, it may be split-level or have sloped parking. Many car parks are independent buildings dedicated exclusively to that use. The design loads for car parks are often less than the office building they serve (50 psf versus 80 psf), leading to long floor spans of 55–60 feet that permit cars to park in rows without supporting columns in between. The most common structural systems in the United States for these structures are either prestressed concrete double-tee floor systems or post-tensioned cast-in-place concrete floor systems. In recent times, car parks built to serve residential and some business properties have been built as part of a larger building, often underground as part of the basement, such as at the Atlantic Station redevelopment in Atlanta. This saves land for other uses (as opposed to a car park), is cheaper and more practical in most cases than a separate structure, and is hidden from view. It protects customers and their cars from weather such as rain, snow, or hot summer sunshine that raises a vehicle's interior temperature to extremely high levels. Underground parking of only two levels was considered an innovative concept in 1964, when developer Louis Lesser developed a two-level underground parking structure under six 10-storey high-rise residential halls at California State University, Los Angeles, which lacked space for horizontal expansion in the 176-acre (0.71 km2) university. 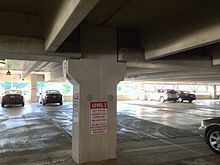 The simple two-level parking structure was considered unusual enough in 1964 that a separate newspaper section entitled "Parking Underground" described the car park as an innovative "concept" and as "subterranean spaces". In Toronto, a 2,400 space car park below Nathan Phillips Square is one of the world's largest. Car parks which serve shopping centres can be built adjacent to the centre for easier access at each floor between shops and parking. One example is Mall of America in Bloomington, Minnesota, USA, which has two large car parks attached to the building, at the eastern and western ends. A common position for car parks within shopping centres in the UK is on the roof, around the various utility systems, enabling customers to take lifts straight down into the centre. Examples of such are The Oracle in Reading and Festival Place in Basingstoke. These car parks often have low ceiling clearances, which restrict access by full-size vans and other large vehicles. On 15 December 2013, a man was killed during a robbery in the multistorey car park at The Mall at Short Hills in Millburn, New Jersey. The paramedics responding to the shooting were delayed because their ambulance was too large to enter the structure. In the United States, costs for multi-storey parking structures are estimated to cost between $25,000 per space, with underground parking costing around $35,000 per space. Parking structures are subjected to the heavy and shifting loads of moving vehicles, and must bear the associated physical stresses. Expansion joints are used between sections not only for thermal expansion but to accommodate the flexing of the structure's sections due to vehicle traffic. Seismic retrofits can be applied where earthquakes are an issue. Some parking structures have partly collapsed, either during construction or years later. In July 2009 a fourth-floor section failed at the Centergy building in midtown Atlanta, pancaking down and destroying more than 30 vehicles but injuring no-one. In December 2007, a car crashed into the wall of the deck at the SouthPark Mall in Charlotte, North Carolina, weakening it and causing a small collapse which destroyed two cars below. On the same day, one under construction in Jacksonville, Florida collapsed as concrete was being poured on the sixth floor. In November 2008, the sudden collapse of the middle level of a deck in Montreal was preceded by warning signs some weeks before, including cracks and water leaks. Parking structures are generally not subject to building inspections after being checked for their initial occupancy permit. In October 2012 four people were killed and nine more injured when a parking structure under construction at a campus of Miami-Dade College in Florida collapsed, purportedly due to an unfinished column. Precast parking structure showing an interior column, girders and double-tee structural floors. The two gray circles are covers to close the lifting anchor holes. As multi-storey car parks have become more common since the middle of the twentieth century, many constructions of such structures have been using precast concrete to reduce the construction time. The design involves putting parking structure parts together. The parts of precast concrete include multi-storey structural wall panels, interior and exterior columns, structural floors, girders, wall panels, stairs and slabs. The precast concrete parts are transported using flatbed semi-trailers to the sites. The structural floor modules may need to be laid tilted during the transportation in order to cover as large floor area as possible while they can be easily transported on the roadways. The modules are lifted using precast concrete lifting anchor systems at the sites for assembly. Decorations may include using of covers to close the holes in the precast concrete that contains the lifting anchors, and installing facades to the exterior of the structures. In modern construction of the precast modules, there are other features to improve the strength of the structure. An example is to use prestressed strands on post-tensioned concrete for the construction of the shear walls. Another example is the use of carbon-fiber-reinforced polymer to replace steel wire mesh to lighten the load and yield more corrosion resistant especially for the cold-climate areas which use salt for melting snow. These structures are not usually known for their architectural value. As Architectural Record has noted, "In the Pantheon of Building Types, the parking garage lurks somewhere in the vicinity of prisons and toll plazas." The New York Times has labeled parking structures as "the grim afterthought of American design". 1111 Lincoln Road, in the South Beach section of Miami Beach, Florida and designed by the internationally known Swiss architectural firm of Herzog & de Meuron. Parking deck is used mostly in the Southern United States. Parking ramp is used in the upper Midwest, especially Minnesota and Wisconsin, and has been observed as far east as Buffalo, New York. Parking building is used in New Zealand. Architects and civil engineers in the USA are likely to call it a parking structure since their work is all about structures and since that term is the vernacular in some of the western United States. When attached to a high-rise of another use, it is sometimes called a parking podium. United States building codes use the term open parking garage to refer to a structure designed for car storage that has openings along at least 40% of the perimeter, as opposed to an enclosed parking garage that requires mechanical ventilation. Natural or mechanical ventilation provides fresh air flow to disperse car exhaust in normal conditions, or hot gas and smoke in case of fire. Typically car park experts describe the number of car park floors in terms of "G+x". G stands for ground and x for the number of floors above ground. For example, G+5 is a multi-story car park structure with a ground floor and 5 floors above that, i.e. a total of 6 floors. Structure car parks are car parks made of structural steel components connected to each other to carry the loads and provide full structural rigidity. Cost savings: inexpensive to manufacture and erect, and requires less maintenance than traditional building methods. Speed: Allows construction/prefabrication off-site with rapid installation on-site. Some suppliers claim construction in days. Durability: Suppliers claim 50-plus years lifespan. Removability: Steel car park structure could be designed to be removed at a later date. Expandability: Steel car park structures can be expanded easily at a later date. Creativity: Steel allows for long column-free spans. The ceiling slab of the steel structure car park is typically made of composite material such as corrugated steel sheets and concrete. The surface of the first-floor parking can be left bare or covered with epoxy or tarmac. Demand, steel features, and innovation have led to the development of a foundationless, modular, removable steel car park structure. To double the parking surface by means of a light steel single-deck car park system. Prefab modular components of the system make each project versatile and suitable for both large and small sized areas. These parking structures are generally demountable and can be relocated to avoid making the choice of converting a surface to parking area irrevocably. They could be used as permanent structures or are conceived as temporary parking facilities for temporary parking demand needs. A number of parking decks have been demounted after a few years – to make room for the development of a permanent structure – and relocated to respond to local parking demand. Not to be confused with Automatic parking, a self-parking feature in a car. The earliest use of an automated parking system (APS) was in Paris in 1905 at the Garage Rue de Ponthieu. The APS consisted of a groundbreaking multi-story concrete structure with an internal elevator to transport cars to upper levels where attendants parked the cars. A 1931 Popular Mechanics article speculated an underground multistorey car park where the car was taken to a parking area by a conveyor then an elevator to shuttles mounted on rails. The total cost of ownership of automated car parks needs to be carefully considered. The actual cost of construction of automated car parks is typically higher than conventional car park structures, however, this can be offset by the higher space efficiency of automated car parks. The cost of the mechanical equipment needed to transport the cars needs to be added to the building cost. In addition, operation and maintenance costs of the mechanical equipment need to be added in order to determine the total cost of ownership. Other costs could be saved, for example, there is no need for an energy-intensive ventilating system, since cars are not driven inside and human cashiers or security personnel may not be needed. For naturally ventilated car parks structures, the ventilation equipment is not needed. Automated car parks rely on similar technology to that used for mechanical handling and document retrieval. The driver leaves the car in an entrance module, and it is then transported to a parking slot by a robotic trolley. For the driver, the process of parking is reduced to leaving the car inside an entrance module. At peak periods a wait may occur before entering or leaving, because loading passengers and luggage occurs at the entrance and exit rather than at the parking stall. This loading blocks the entrance or exit from being available to others. It is generally not recommended to use automated car parks for high peak hour volume facilities. Ultrasonic sensors above each lot in this indoor car park determine if a car has already taken the lot and indicate using LEDs; and some can send a Bluetooth/SMS message with the parking space number or code. Modern car parks utilize a variety of technologies to help motorists find unoccupied parking spaces, car location when returning to the vehicle and improve their experience. This includes adaptive lighting, sensors and parking space LED indicators (red for occupied, green for available and blue is reserved for the disabled; above every parking space), indoor positioning system (IPS), including QR code, and mobile payment options. The Santa Monica Place shopping mall in California has cameras on each stall that can help count the lot occupancy and find lost cars. Online booking technology service providers have been created to helped drivers find long-term parking in an automated manner, while also providing significant savings for those who book parking spaces ahead of time. They use real-time inventory management checking technology to display car parks with availability, sorted by price and distance from the airport. In October 2009, the National Building Museum opened an exhibition solely devoted to the study of multistorey car parks and their impact on the built environment. This exhibition, titled House of Cars: Innovation and the Parking Garage, was on view until 11 July 2010. ^ a b "How not to create traffic jams, pollution and urban sprawl". The Economist. Retrieved 14 April 2017. ^ "asphaltnation.com". Retrieved 24 November 2016. ^ "The Guide to Parking Lots". Discount Park & Ride. 9 January 2015. Retrieved 27 March 2015. ^ Los Angeles Times, 25 June 1963, "High Rise Developer Defends Loss of View to Convenience"
^ Los Angeles Times, 15 March 1964, Tom Cameron, "$118 Million Going Into Expansion at L.A. State"
^ Queally, James (14 January 2014). "'Where is it?' Panicked 911 calls from wife of lawyer killed in mall carjacking beg for ambulance". The Star-Ledger. Retrieved 15 January 2014. ^ "North Carolina Parking Deck Collapse Kills 1". Fox News. 6 December 2007. ^ "Man dies after Montreal parking garage roof collapses". CBC News. 26 November 2008. ^ Castillo, Gregory (30 October 2012). "Four Dead, Several Injured After Parking Garage Collapses At West Campus". Miami-Dade College. Retrieved 26 August 2014. ^ "Miami Dade College Parking Garage Collapsed Due To Unfinished Column: Lawyer". Huffington Post. 29 March 2013. Retrieved 26 August 2014. ^ "High Precast Parking Systems" (PDF). High Concrete Group. Retrieved 3 June 2014. ^ a b Beth Broome (June 2010). "1111 Lincoln Road". Architectural Record. ^ a b Michael Barbaro (24 January 2011). "A Miami Beach Event Space. Parking Space, Too". The New York Times. p. A1. ^ "Wisconsin English varieties". Wisconsin Englishes. Center for the Study of Upper Midwestern Cultures; Wisconsin Humanities Council. Archived from the original on 3 June 2009. Retrieved 29 October 2016. ^ "Buffalo Civic Auto Ramps". Buffalo Civic Auto Ramps. Retrieved 2 August 2017. ^ "Judging the Parking Podiums of DTLA's Newest High-Rises – Los Angeles Magazine". Los Angeles Magazine. 13 October 2015. Retrieved 14 April 2017. ^ a b Sanders McDonald, Shannon. "Cars, Parking and Sustainability", The Transportation Research Forum http://www.trforum.org/.Retrieved on 16 October 2012. ^ "parking sensor indicator/parking space indicator/led parking lot lighting, View car parking led indicator, KEYOP Product Details from Xiamen Keytop Communication & Technology Company Limited on Alibaba.com". Retrieved 24 November 2016. ^ "House of Cars: Innovation and the Parking Garage". Retrieved 24 November 2016. Wikimedia Commons has media related to Multi-storey car parks. "Automatic invisible compact parking. Patent RU 97419". Mary Beth Klatt (21 October 2005). "Car culture". Preservation Online. National Trust for Historic Preservation. p. 1. Archived from the original on 11 February 2007. Retrieved 22 February 2007. "Robotic Parking Garage: No Tip Necessary "
This page was last edited on 24 March 2019, at 23:24 (UTC).